Go hunting for treasure on the high seas in Ghost Pirates, a 5 reel, 243 ways to win video slot powered by Net Entertainment. Featuring a ghoulish band of shipmates, this crew can help you land the gold courtesy of a bonus feature that awards up to 50 free spins where all payouts are trebled. Set sail from between 25p and £62.50 per spin. Ghost Pirates is a relative oldie in the online video slot world, first hitting the virtual shelves in 2013. The visuals haven’t really dated though – set against an ocean backdrop featuring a sailing ship and flanked by skeleton sailors and rigging, the reels have a strong nautical feel. Symbols include anchors, cannons, jugs of ale, maps and compasses, medallions and pistols. Those lower value objects are joined by the gruesome looking crew. Look out for Polly the parrot, the Mad Monkey, One Eyed Ed and Peggy Rotten who is the most lucrative symbol, awarding 1,500 coins if you land a 5 symbol combination. The ghost pirate is the game’s wild, appearing on reels 2 and 4 only – it doesn’t offer any specific payouts but it does replace all other symbols including the scatter. The treasure chest is that scatter. Land 3 or more of them on successive reels, starting from reel 1, and you’ll be paid double your total stake and will activate the Free Spins feature. You will be awarded 15 free spins. The prize increases to 20 times your stake and 20 free spins with 4 scatters. Land a full 5 and you’ll get 25 free spins alongside a payout of some 50 times your total stake. Better still, all winning combinations hit during the feature are boosted by a 3x multiplier and trebled. Land more scatters and you’ll re-trigger the feature and get even more free spins with up to 50 available. 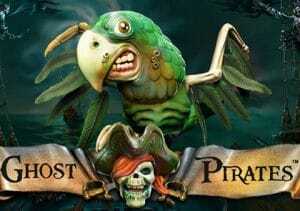 Ghost Pirates is a volatile slot – there will be plenty of spells when your pillaging will come to very little. It is possible to win a big haul of booty on a single spin though, especially during the free spins feature where the trebling multiplier can have a big impact. The maximum win stands at 768 times your total stake. Ghost Pirates is a nice fusion of the pirate and horror genres – the visuals are top notch with the action playing out to a sweeping orchestral soundtrack which is right in keeping with the theme. If you have the patience and bankroll to cope with the swings, it’s well worth setting sail with this band of Ghosts Pirates. If the theme is appealing, Novomatic’s Red Lady is recommended.